1. What Does It Mean to “Float” a Horse’s Teeth? When someone says they are going to have their horse’s teeth floated they mean they are going to have a horse dentist or equine veterinarian come out and remove sharp edges from the horse’s teeth. In addition to smoothing out sharp teeth, the veterinarian will check the horse’s mouth for other issues like a parrot mouth, infection, bad teeth, etc. Specialized tools and equipment are needed for horse teeth floating. Typically the veterinarian will use a speculum to keep the horse’s mouth open, a variety of special horse teeth files and rasps, a dousing device to rinse the mouth out and a stainless steel bucket to rinse her tools. Generally the horse is lightly sedated to the horse will stand quietly for the procedure. The vet typically starts by performing an initial evaluation and discussing any concerns with the owner. The vet may ask about training issues, eating habits, talks about weight and behavior. 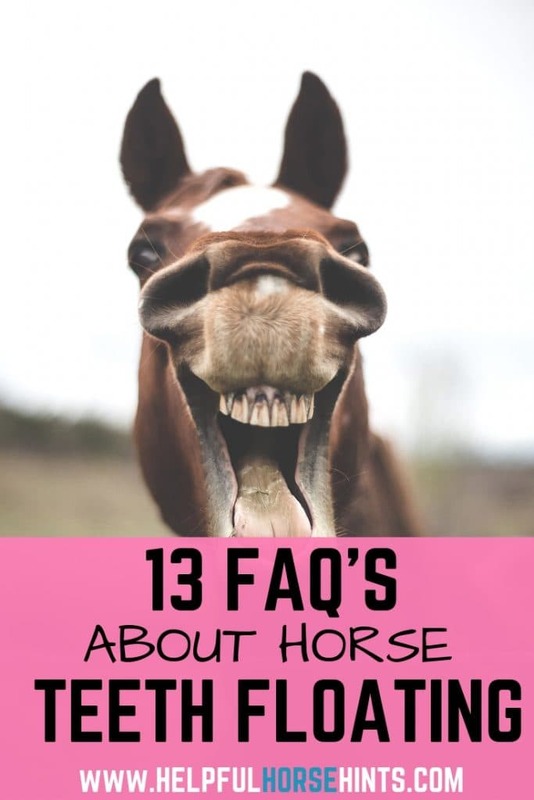 All of these questions may seem unrelated but they will help the vet to learn more about the horse and help her look to see if the teeth could be causing other issues. Once the sedation has kicked in the veterinarian will typically use the speculum to hold the horses mouth open. He’ll then use his tools to address any issues in the mouth. He may need to use files or even clippers. As the veterinarian progresses he’ll constantly check to see how things are aligning. Once he is all done he’ll release the speculum. The veterinarian may give the horse a shot for residual pain and soreness from the procedure as well as any after care instructions like how long to wait before riding, etc. 2. Why Do Horses Need Their Teeth Floated? In the wild horses graze all day on naturally wear down their teeth. They have different grasses and shrubs which help with the process as well. In captivity, horses are typically fed the same ration two or three times a day. If the horses are stabled in a pasture situation, it’s typically seeded with one or two types of soft grasses. Because of this, the horses teeth has a propensity to develop sharp hooks due to uneven wear. Floating the horses teeth removes those sharp points. The cost of horse teeth floating really depends on area. I have Facebook friends all across the United States and asked them this very question. What I found out was pretty much what I expected. 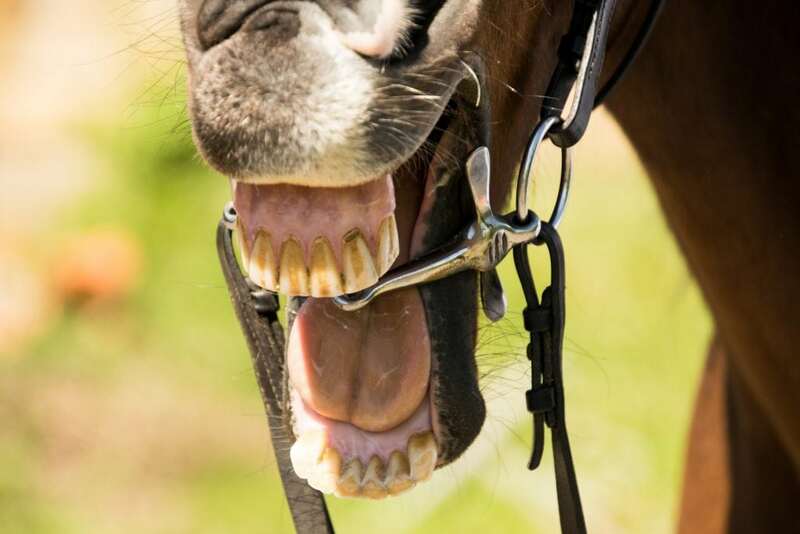 The cost of horse teeth floating really depends on where you live. Young horse with baby teeth. 4. How Many Teeth Do Horses Have? Baby horses are usually born with no teeth. Slowly but surely they start coming out starting with their 1st incisors. Their other teeth start growing in as they get older. By the time they are one year old they will have 24 teeth! 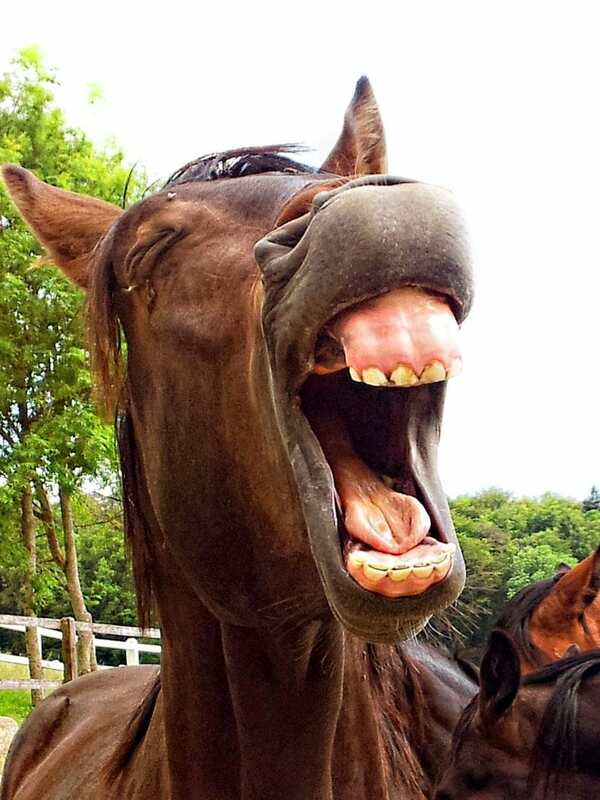 An adult horse has between 36 and 40 teeth. This number varies because some mares don’t get canine teeth (also called bridle teeth). 5. What are Wolf Teeth In Horses? If you have ever heard of a horse having a wolf tooth you may have been confused. Why would a horse have a “wolf” tooth. A wolf tooth is a small, vestigial tooth that usually sits in front of the first premolar or cheek tooth. Generally an equine dentist will remove these teeth as part of a normal teeth floating procedure as they serve no purpose. Both fillies and colts can get wolf teeth. 6. What are Horse Canine Teeth? Canine teeth are different from wolf teeth. Typically only seen in colts, these teeth erupt just behind the premolars. According to Wikipedia, less than 28% of mares will have canine teeth. Unlike wolf teeth, canine teeth normally do not cause the horse any issue and are usually left alone. If these teeth have grown long, sometimes they will be filed down during a routine dental float. 7. Do Horses Have Baby Teeth? All horses start out with baby teeth. These teeth are shed when their adult teeth come in. Typically this process is referred to as “losing caps”. In fact, with young horses it is not uncommon to find these baby teeth in your horses feeder or stall. Not to worry, this is a normal process. As the permanent teeth come in, the baby teeth fall out. 8. Can You Tell How Old a Horse is by its Teeth? A horse’s teeth age in a specific pattern. As such, a horse’s age can typically be estimated with some degree of accuracy based on it’s tooth pattern. The age is most closely approximated in younger horses and guesses become less accurate as a horse ages. Once a horses caps shed and “cups” wear, a horseman must rely on the galvayne’s groove and wearing of the horses “cups” as indicators of age. Different forage types as well as behavioral issues, such as cribbing, can cause irregular wear on a horse’s teeth making it more difficult to guess their age. Older horses start getting “long in the tooth” and their galvayne’s groove will start to grow. 9. How often should you float your horse’s teeth? A horse’s teeth should be checked annually by a veterinarian during their annual exam. Horse’s with known dental issues, such as parrot mouth, may need to have them checked biannually. Always rely on your veterinarians advice for this type of thing. If your horse is showing any signs of dental discomfort such as dropping food, tossing his head, or being unwilling to eat or chew food, call your vet so he can look for and address a dental issue sooner than later. 10. Should you brush your horse’s teeth? The short and quick answer here is no, horse’s don’t need their teeth brushed. Horse’s aren’t like humans. The best dental care you can provide for them is to have a veterinarian professionally address their dental health at least once per year. 11. Can You Float Your Horse’s Teeth Yourself? Equine dentistry requires special education. It is absolutely not something you should attempt. It isn’t something as simple as filing down their teeth. The way a horse’s jaw moves, the way their teeth align, how their head moves, a veterinarian must take all of this into consideration. You should never attempt to float your own horses teeth. Doing so could cause irreparable harm to your horses mouth and severely affect his health and well being. 12. How to Fix a Horse with Bad Teeth? If you feel your horse has bad teeth or a dental issue, the best way to help him is to schedule a veterinary exam. A veterinarian will be best able to advise you how to proceed with your horses’ specific issue. Keep in mind that almost any dental problem can be overcome by your veterinarian. Your responsibility as a horse owner is to work with your veterinarian to address dental issues and your horse’s overall health. A bit rests between the front teeth and the back teeth. A bit that is properly placed in the mouth should not hurt a horse’s teeth. 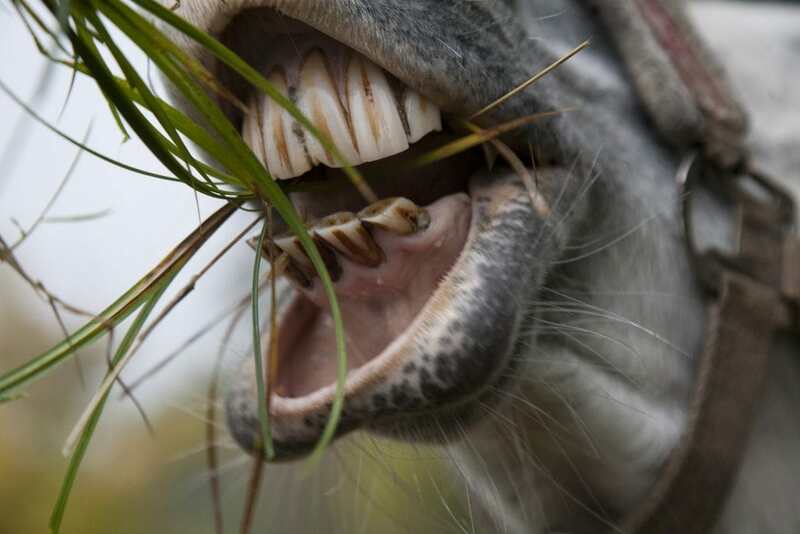 Horse’s have a space between their front teeth and their back teeth that provides a place for the bit to rest. The bridle controls how high or how low the bit sits. As long as the rider adjusts the bridle, the bit should sit comfortably in the horse’s mouth without bothering their teeth.